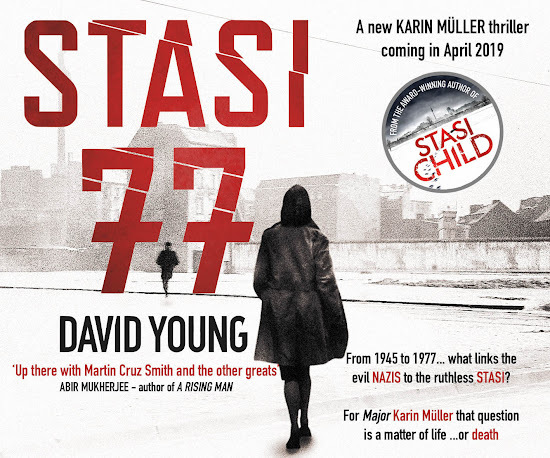 The fourth novel in the Karin Müller series, Stasi 77, will be published on April 19th, 2019 in the UK. Both Stasi Child and Stasi Wolf are available in the UK as paperbacks and as e-books. Foreign editions of one or more of the books are or will be available in French, Hebrew, Polish, Italian, Spanish, Danish, Japanese, Czech, and Greek with more hopefully to come. A hardback edition of Stasi Child was published by St Martin's Press in the USA & Canada in August 2017. US versions of Stasi Wolf and A Darker State will be available shortly thanks to a new deal signed by David's publishers, Bonnier Zaffre. Unabridged Audio CDs and audio downloads of both Stasi Child, Stasi Wolf, and A Darker State are available, eg on Audible. A deal has been signed for audio versions of the following two books as well.